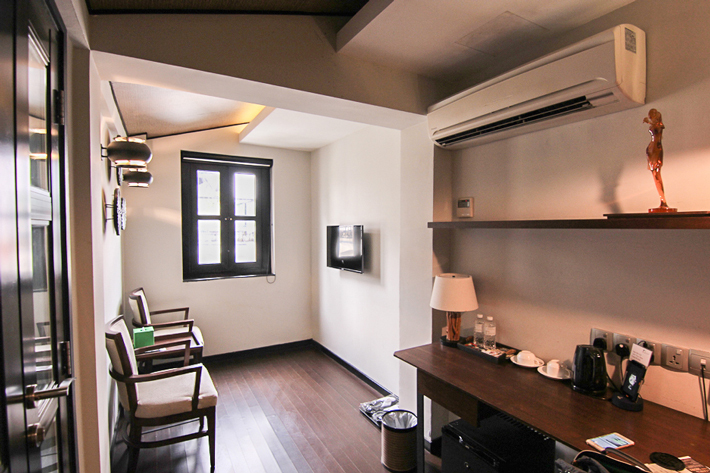 Situated in the heritage district of Kampong Glam, Hotel Clover @ 33 Jalan Sultan is housed in a row of 17 two-storey conserved shophouses, and just a short 5-minute sheltered walk from Nicoll Highway MRT Station. Hotel Clover has an urban garden theme, with lush green vertical walls of plants and open garden balconies providing guests a sense of tranquil serenity. 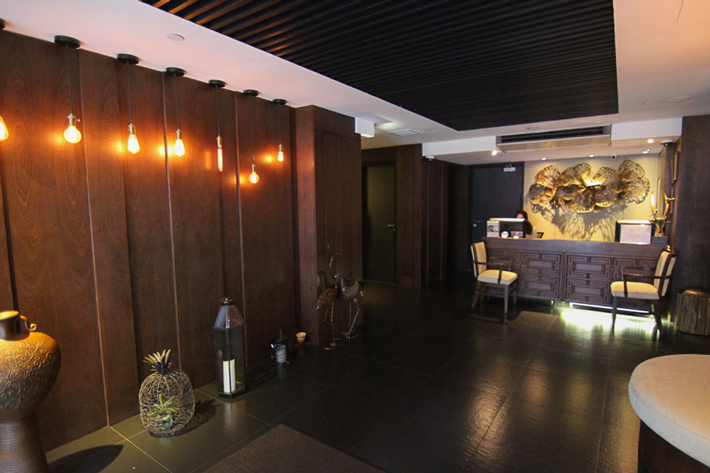 Upon stepping into the hotel lobby, we were greeted by the sight of rich, dark-wood furnishing with modern, tungsten light bulbs decorating the walls. The dark wood aesthetic and warm lighting is consistent throughout the entire hotel, giving it a cosy and comfortable feel. The hotel check-in process was extremely clear-cut and efficient. Within 5 minutes of verifying my particulars, we received the room key card and proceeded to our room. Check-in begins at 3pm and check-out is by 12pm. The hotel is equipped with a total of 88 rooms and suites, all of which feature interiors of rich dark wood furnishings and oriental ornaments. Prices start from SGD153 to SGD345. The second floor comprises of an indoor area and a partially outdoor area. 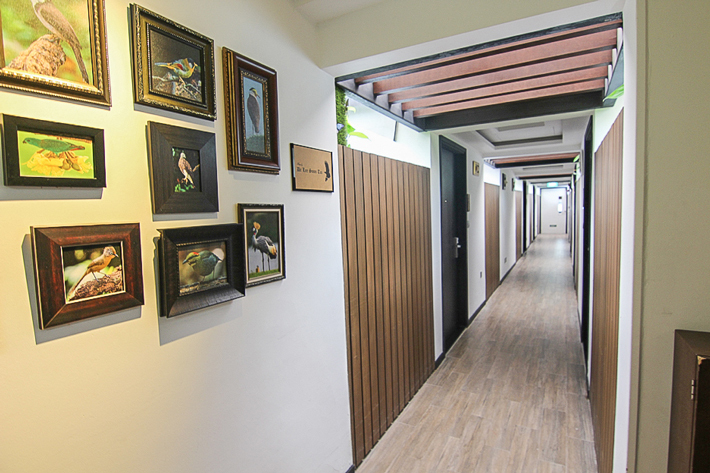 Our Premier Garden Room is situated in the outdoor area, thus the corridor leading to our room was very airy and lets in plenty of natural light. Upon stepping into our room, we were initially surprised as we were greeted by the sight of only the living room, with no bedroom in sight. The living room is fitted with a television area and a study table, suitable for both the leisure and business traveller. On the left of the living room, however, lies a double door that leads to an airy patio decked with vertical garden. That must be where our bedroom resides, we thought. As we followed the path, we found the patio leading into the bedroom through another double door. The bedroom fits a queen bed that faces the bathroom, with a small television monitor fitted above the bathroom doors. The bathroom is fitted with basic bathroom amenities and a rain shower. I took quite a while to find the hairdryer, which I eventually found in one of the drawers in the living room. Personally, I could not get used to the layout of the room as it was rather inconvenient to move between the living area and the bedroom area. Furthermore, even though the Premier Garden Room is of a bigger size than the standard rooms, with the patio dividing the living and bedroom space, it made the bedroom size only able to fit one queen size bed snugly. As the same dark wood furnishing is used in the room, the room was relatively dark. 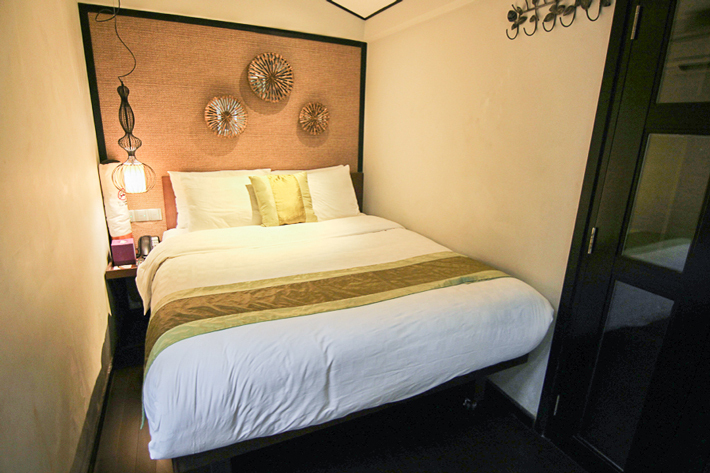 It is fitted with warm orange lights, suited for those who want a cosy stay. The Premier Garden Room is also fitted with a safe, two bathrobes and a handy smart phone. Read more about the handy smart phone at 5footway.inn. A small, 24-hour gym lies on the first floor of Hotel Clover, and it is fitted with basic gym equipment such as a treadmill, exercise bike and some barbells. 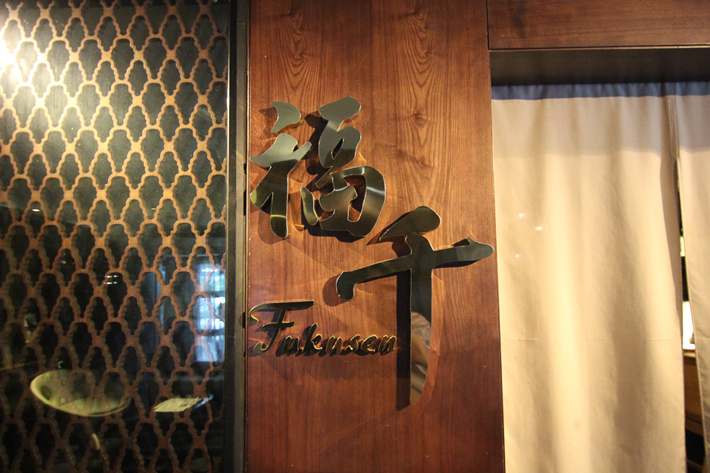 We were delighted to have Fukusen host us for dinner. The Japanese restaurant can be found on the first floor of Hotel Clover, right next to the check-in counter. 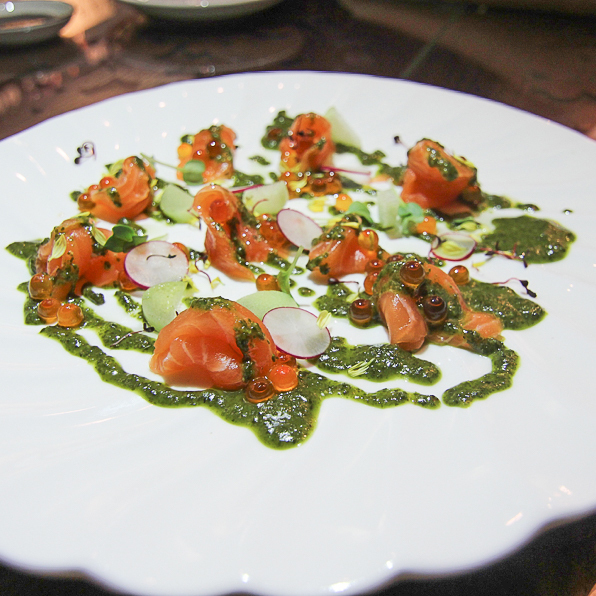 For starters, we ordered the Spinach Salmon Carpaccio ($15.80), where Salmon sashimi was doused in a special spinach sauce and garnished with salmon roe. We found it refreshing to have such a combination of sashimi with the sauce. The small servings also made every bite of the appetizer a delight to the senses. 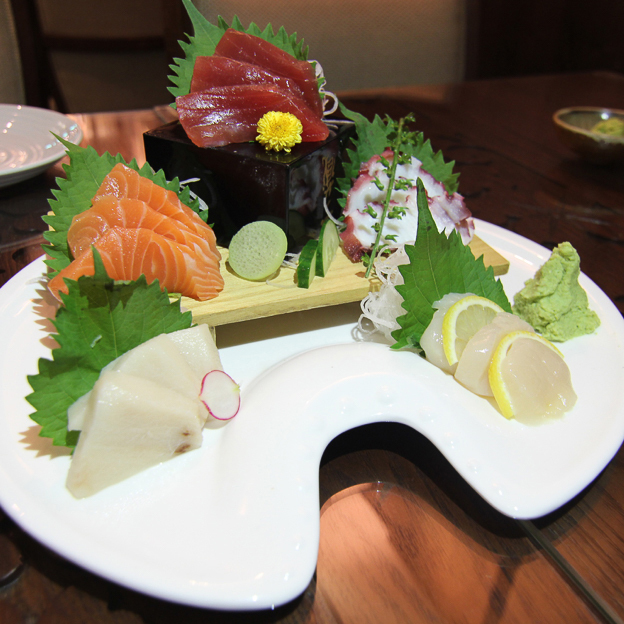 We also ordered 5 types of sashimi ($49.80), comprising of swordfish, salmon, tuna, octopus and scallop (left to right). While it was difficult to pick a favourite among the variety, the scallop was a crowd favourite because of how it dissolves in our mouths. Every piece of sashimi was savoured with deliberate slowness, to prolong the taste of freshness in our palates. The champion of the night was the Wagyu Don ($43.80), where 7 to 8 thin slices of tender, melt-in-your-mouth Wagyu Beef tops a bowl of rice, paired with a sous-vide egg and garnished with salmon roe and fresh spring onions. 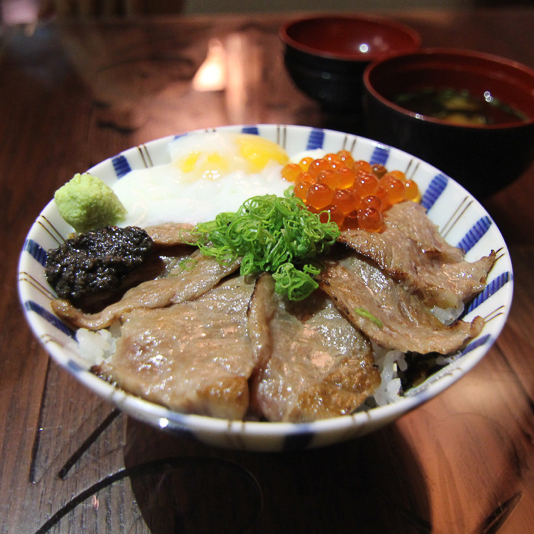 All Donburi sets come with a bowl of miso soup. 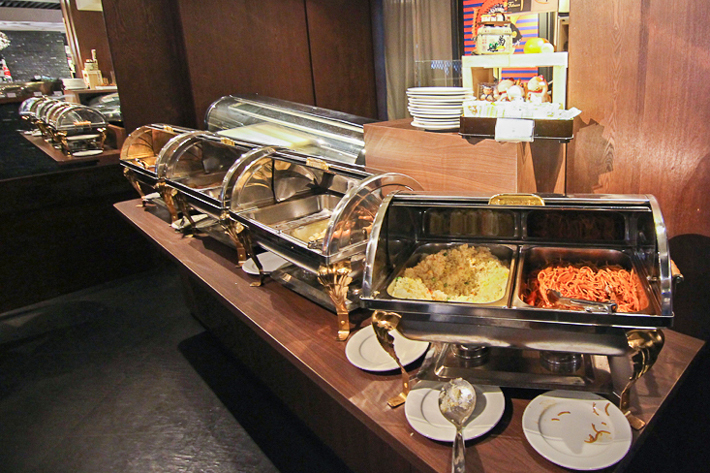 Breakfast is also served in Fukusen until 10am. 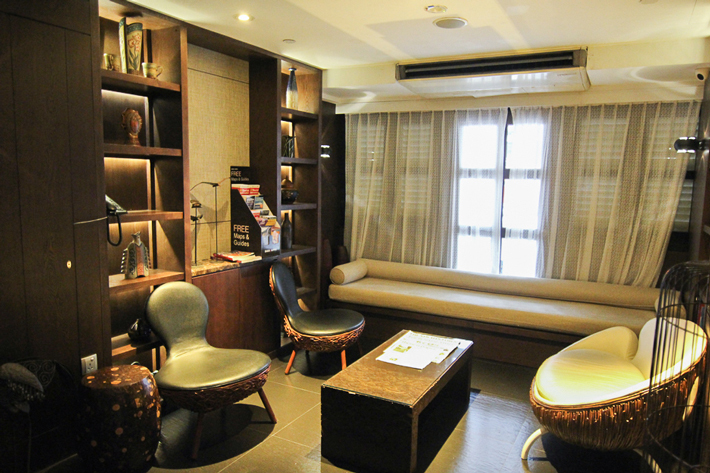 Hotel Clover is located near Bugis, one of the best shopping destinations in Singapore. Head to Bugis Street for cheap bargains and Bugis Junction or Bugis+ for shopping malls. For those of you with an eye for art and heritage, the Singapore Art Museum, Peranakan Museum, CHIJMES and the National Museum of Singapore are just a short bus ride away. Special thanks to Hotel Clover & Fukusen for making this experience possible! All opinions remain my own.